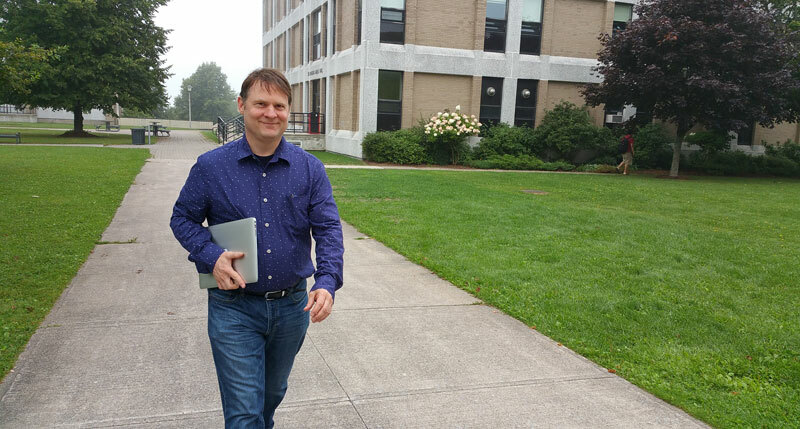 University of New Brunswick professor Chris Baker is on a journey to help solve global hunger – by harnessing the power of open data. Dr. Baker is invited to speak next week at an international summit in New York City that is bringing together world leaders, researchers, farmers, and students to discuss how openly sharing data might help ease hunger and malnutrition. In addition to attending the Global Open Data for Agriculture and Nutrition (GODAN) summit, he will also attend a high-level forum on the issue held at the United Nations that will include further presentations by senior government ministers, leaders in business and society, as well as UN officials. “This is a tremendous opportunity to be with people from around the world who have the know-how and determination to tackle one of our society’s most pressing and tragic plights,” says Dr. Baker, recognized as one of the top open data experts in Canada. “I’m confident we have technology that can help solve this problem,” says Dr. Baker, chair of the computer science department at UNB in Saint John. GODAN is a rapidly growing initiative, with nearly 300 partners from non-governmental, international and private-sector organizations and national governments. It was born in the wake of the 2012 commitment by leaders of the G-8 countries to establish worldwide food security. Key backers include the governments of the U.S., U.K. and Kenya. Estimating that some 800 million people in every corner of the globe are affected by debilitating hunger or malnutrition, backers of the GODAN project are convinced that the solution to eliminating hunger lies within existing, but often unavailable, agriculture and nutrition data silos. With open data, they say, a mother in Malawi can choose seeds for a plentiful harvest to feed her hungry family, a farmer in the United States can make their soil nutrient­-rich again, and a smallholder farmer in Tanzania will know market conditions to get more money for their harvest. Dr. Baker was invited to the summit by GODAN’s executive director, who spoke at an Open Data Summit in Saint John earlier this year where Dr. Baker was recognized as a finalist for Canadian Open Data Leader of the Year. En route to New York, Dr. Baker will participate in a New Brunswick double bill at MIT when he and fellow UNB adjunct professor Bruce Spencer, an expert on artificial intelligence and automated reasoning, will give talks at MIT to a community of experts in data integration.